I wake up in Capsule Inn Osaka, the world's first capsule hotel. I expected it to be more of a novelty, but its tiny size mimics my RV so closely that it's the most familiar place I've slept all month. I'm in the middle of my 7 day unlimited train pass, so there's no time for dilly-dallying. I jog to the train station, scarf down a fruit and nut bar, and head for Nara. Nara is home of the biggest Buddha in Japan, which is surrounded by a giant wooden building, which is surrounded by schoolchildren with mandates to practice their English with whitey, who are surrounded by aggressive deer trying to eat anything they can get from the children. After feeding the deer, conversing with the children, and taking a few pictures of the truly enormous Buddha, I run back to the station just in time to catch my train. The capsule hotel and Nara are just warm-ups (albeit totally out of the way warm-ups) to the main event: staying with a tea-farming family in Fujieda, Japan. Ayumi picks me up at the Fujieda station. She's wearing ninja-toed boots and work pants, and is driving a tiny Japanese pickup truck with a dog in the back. I immediately realize that this family isn't just marketing or selling the tea-- it's their life. I hop in the truck and chat with Ayumi as we head to the tea fields. Fujieda is part of the famous Shizuoka region, known for producing some of the best green tea in the world. Unlike areas like Kagoshima, in the south, Shizuoka farmers grow their tea on the mountains, bordered by forests. So we wind through tightly coiled mountain roads with terrifying speed until we arrive to a steep tea field rooted into the side of the mountain. Ayumi's brother and sister in law are holding the gas powered tea harvester, waiting for me. I watch them harvest a couple rows of tea, and then I'm handed control of the machine and I get to harvest a couple rows with Ayumi's brother. I'm grateful to get to experience a tiny sliver of what it's like to be a tea farmer. It's the last day of the tea season, so as soon as we bag up the tea, we throw it into the back of the truck and head to the tea processing plant. I think of tea as a delicate and refined indulgence, surrounded by ceremony and precision. That may be true of the consumption of it, but not of the creation process. Within minutes of backing the truck into the processing plant, we're hauling fifty pound bags out of the truck, weighing them, and dumping them into the hopper. The plant is steamy and is permeated by a delicious tea smell. Ayumi guides me through the maze of heavy iron machines that process the tea. It may be a simple drink, but the processing of it is complex. The leaves go through a dozen or so steps of steaming, shaping, sorting, and drying. At each step we grab handfuls of the tea to smell it and see how the previous step has altered it. At the end Ayumi gives me a plastic bag, which we stuff full of tea straight out of the end of the chain of machines. Despite being bancha, the last and lowest grade harvest of the year, it tastes great when I later drink it in Berlin with some friends. From the tea factory we head back to their house. I could probably write an entire post about how beautiful their house is. Everything is made of wood, from the elaborately carved shoji screens to the entire tree that's lacquered and serves as a two-story support. We sit at the dinner table, which is also carved from a single tree, and eat an amazing meal. Everything is home-made or home grown, including the pickles, miso, and the persimmons we picked from a tree out front for dessert. After dinner I teach some of the family to play poker, using brown rice grains as tiny chips. I lose. The next day we ride horses, prune the tea plants for next year, eat lunch, and, of course, taste tea. Ayumi and her father prepare for me their first flush sencha, first flush kukicha, and a black tea they process themselves. Each one is unquestionably the best I've ever had in its category. I'm not sure how much of the credit goes to the actual tea itself, and how much goes to the precise brewing process orchestrated by Ayumi's father. 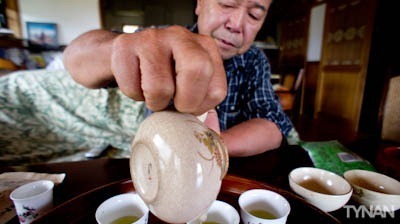 He's been growing (and brewing) organic tea for over thirty-five years. Finally I have to head back to Tokyo for the next adventure, but I don't leave empty handed. Ayumi gives me a big bag of ripe persimmons and a bag of the kukicha tea, which is my favorite everyday tea to drink. They invite me to come back in the Spring for the first harvest-- as if I need another reason to justify my next trip to Japan. Huge thanks to Ayumi and her amazing family! I can't wait to visit again! I'm in Berlin now. I'm going to skip the rest of my Japan stories and write about Thailand next. Hi Tynan, This is Ian from http://NaturaliTea.com (Ayumi Kinezuka's English online store). Mind if I link to this experience? Yes, definitely please do. I'm happy to help in any way I can. This is absolutely amazing I found this! In exactly one week I will be headed off to Japan, first stop in Yokosuka for a week then heading south to Shizuoaka. I am going to be meeting Ayumi and her family as I stay with them for 10 days to learn about their lifestyle and the beauty of sencha production. We should converse on a deeper level about the farm and your experience! I'm very curious. Cool man, how did you get hooked up with this family? Acquaintances? I lived in ?? for awhile and if I don't have friends that own a tea farm (or anything similar) how do you suggest setting up such an alternative experience on a trip (in any other country for that matter). Been reading for a bit, good stuff! Considering your goal to experience everything life has to offer, would you consider taking psychedelics? Haha, yea right Captain Power. I somehow managed to stumble onto this site after reading that pickup book he's in. He's clearly living a much more exciting and fulfilling life then that of a pickup artist. I know I'm of the majority when I say I would stop reading if this became a pickup blog. Haha, love youtynan. You are the greatest bald man in the world. I thnk maybe you arent healthy. Explain to me where you get enough protein from? Definitely interesting! I like tea and it would be awesome to have an experience understanding its process agriculturally and especially getting to have an opportunity to taste the live likening of it also. Have fun in Thailand! That's so cool Tynan. Isn't Japan relatively expensive to explore? I hear that the urban environment is completely different than the big city. What do you think? So, I'm in Japan right now. I stayed up all night packing, laundering, and cleaning the kitchen so that it would be pleasant when I got back. Jonah and Evan hung out with me to keep me awake. The best part was that I miscalculated the time and had to race to the bus station at top speed on my electric skateboard with my suitcase on my back. Luckily it's the best suitcase ever, so that was doable. Todd and I made no plans prior to our day of departure. No hotel. No tours. Nothing. We didn't really even read about Japan. Early that morning, though, I scrambled and wrote some posts to craigslist looking for a place to stay. One guy responded, offering a very cheap room with bunk beds near Tokyo. With no better alternatives, we agreed. Our flight went without incident. I spent it learning Mega Memory, watching Survivor Season 3, and sleeping just enough to get adjusted to Japanese time. Todd took a video of me sleeping, snoring, and tossing my head left and right as I tried to stay situated on the tiny little headrest. When you travel through a dangerous country, you're generally safe if you're self-aware and vigilant, and generally unsafe if you're unaware and distracted. I was in the Philippines for four days recently, and I generally had my awareness high. Except for my last night there. For whatever reason, when you're about to leave somewhere and nothing bad has happened, it's easy to lapse in awareness. I was exhausted at the end of the trip, as I'd done a bunch of tedious administrative work with an intense focused effort on getting it done, and I'd been doing some mental training at the same time to increase my focus, ability to stay focused and single-mindedness. And it had all gone well.